(Newser) – Bumble Bee Foods will fork out $6 million for the horrific death of an employee cooked alive in 12,000 pounds of tuna fish, NBC News reports. Announced Wednesday by prosecutors, the plea agreement is California's biggest ever for a workplace safety violation. 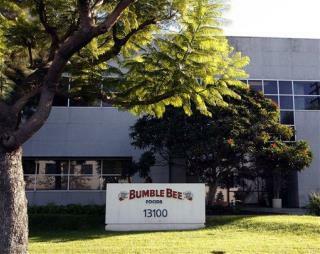 It consists of $3 million to buy new automated ovens, $1.5 million to the state government and courts, and $1.5 million to the family of Jose Melena, 62, who died at Bumble Bee's Santa Fe Springs plant in 2012. He was working in a 36-foot-by-54-inch oven—likely fixing or altering a chain inside, the Whittier Daily News reports—when a co-worker assumed Melena was in the bathroom, dumped in tuna, and turned on the oven. An autopsy concluded Melena died from burns in the 270-degree pressure cooker. note to self: self, don't take a nap at work. especially don't take a nap at work in a giant tuna oven. i thought the tuna tasted odd!